“We are involved in HopeHouse International, partially in response to our ties with its founder, our friend, Deneen Turner. Deneen’s mother escaped from Ukraine during World War II, and Deneen introduced us to this wonderful organization a few years ago. HopeHouse International exists so that orphans can be adopted by helping Ukrainian Christian couples acquire adequate housing, which makes them eligible (according to their government) to adopt three or more children. Mrs. Turner’s Ukrainian heritage and personal background has given her a passion for orphaned children. She and her family have been actively involved in helping orphans, remaining steadfast and committed to this mission for over twenty years.” page 129-130, Does God Still Bless the USA? We thank Lee Greenwood and his wife, Kimberly, for their dear friendship and many years of active involvement with our mission. Does God Still Bless the USA? is an inspirational book about family, country, and Lee’s incredible journey as a multi-grammy award winning artist and songwriter, to include one of our nation’s most patriotic songs, “God Bless the USA.” As a bonus, you will love reading the 30-Day Devotional Guide written by Lee and Kimberly in the back of the book. 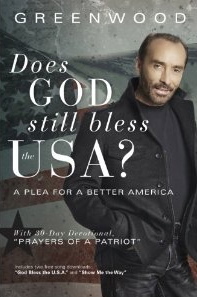 Purchase or download the book at www.tatepublishing.com or go to www.LeeGreenwood.com.